a major gulf still exists between the leading markets and the laggards. In October 2010, Alastair Brydon reported on his analysis of mobile broadband penetration across Europe, and revealed evidence of a clear two-speed Europe. By January 2010, penetration of mobile dongles and data cards had exceeded 15% in Finland and Austria. In contrast with the leading markets, France and Germany had lower than average penetration. Now, we have the latest mobile broadband penetration data for all EU member states for January 2011, which makes interesting reading. Across Europe as a whole, average penetration of mobile dongles and datacards reached 7.2% in January 2011 – a two percentage point increase from 5.2% in January 2010. This reflects a slight overall deceleration in mobile broadband penetration growth during the year, since mobile broadband penetration increased by 2.4 percentage points in the previous year. This overall average figure masks significant differences between markets, as was the case in Alastair’s previous analysis, and also masks the substantial increases in mobile broadband penetration being experienced in some countries. 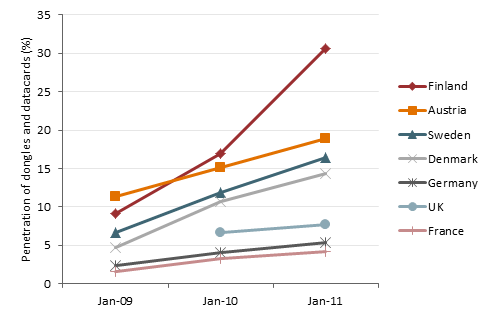 Finland continues to have the highest mobile broadband penetration in Europe, exceeding 30% in January 2011. This corresponds to a very large – 13.6 percentage point – increase over the previous year, which is substantially higher than what seemed at the time a very large increase in the previous year (of 7.9 percentage points). In Finland, LTE is being rapidly deployed in order to support this growth and enhance mobile broadband services still further. Now, four European markets have mobile penetration rates in excess of 10%, including Finland (30.6%), Austria (18.9%), Sweden (16.4%) and Denmark (14.4%). In contrast with the leading markets, several European countries have experienced below-average growth in penetration, including Germany, the UK and France, with 1.3, 1.0 and 0.9 percentage point annual increases (well below the 2.0 percentage point average increase across all EU member states). In the UK, the introduction of substantially-reduced monthly data allowances for mobile broadband services has helped mobile network operators avoid major network capacity crises, albeit at a substantial cost of reduced revenue potential from data services. The combination of less attractive mobile broadband tariffs and relatively poor quality of service of mobile broadband services in the UK has significantly dampened mobile broadband penetration growth. With no substantial uplift in network capital investment in sight, and in the absence of the introduction of LTE services, I cannot see how the mobile broadband penetration gap with leading markets will be bridged, at least in the short-to-medium term. Leading mobile broadband markets, such as Finland, are reaping the benefits of very high 3G penetration coverage and early introduction of LTE services. Dr Mark Heath co-founded Unwired Insight in 2001, to provide analysis and market intelligence for the mobile telecommunications industry. Previously he contributed to the standardisation of GSM, UMTS and DECT and held senior roles for a mobile network operator and equipment manufacturer. Mark has written over 40 industry reports and has advised investors, network operators, equipment vendors, lawyers and government bodies.